张海鑫, 苏琪. 中性粒细胞与淋巴细胞比值在Ⅱ、Ⅲ期中低位直肠癌评估中的临床价值[J]. 中国医科大学学报, 2019, 48(1): 75-77, 84. ZHANG Haixin, SU Qi. Clinical Value of Neutrophil/Lymphocyte Ratio in StageⅡand Ⅲ Middle and Low Rectal Cancer[J]. Journal of China Medical University, 2019, 48(1): 75-77, 84. Abstract: Objective To explore the clinical value of neutrophil/lymphocyte ratio (NLR) in staging of stage Ⅱ/Ⅲ middle and low rectal cancer. Methods The clinical and pathological data of 111 patients with middle and low rectal cancer who underwent surgical treatment were retrospectively analyzed. The NLR values along with various clinical factors and pathological parameters were also statistically analyzed, and then the relationship between preoperative NLR and various clinical factors was determined. All patients were divided into high and low groups based on NLR, with the cut-off value of 1.99. Then, the clinical, pathological parameters and disease-free survival of the two groups were analyzed. Results The maximum diameter of the tumor and the NLR value were positively correlated (P < 0.05). The patients with high and low NLR had significant differences in age, stage Ⅱ and Ⅲ, N stage, pathological type, maximum diameter of the tumor, and disease-free survival (P < 0.05). 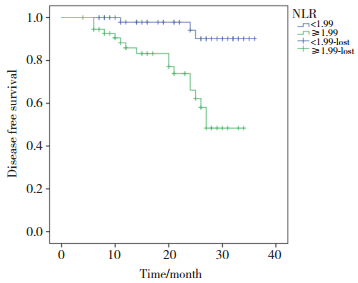 Conclusion Preoperative NLR values may be used as predictive values for the pathological parameters of stage Ⅱ and Ⅲ middle and low rectal cancer, and NLR may be an indicator of its prognostic assessment. BUDU V, MOGOANT CA, FANUTA B, et al. The anatomical relations of the sphenoid sinus and their implications in sphenoid endoscopic surgery[J]. Rom J Morphol Embryo, 2012, 54(1): 13-16. SALEH P, BASTANI P, PIRI R, et al. Antimicrobial prophylaxis for surgical site infections in surgical wards in NorthWest Iran[J]. Life Sci J, 2013, 10(11): 1977-1981. ÖZGEHAN G, KAHRAMANCA Ş, KAYAiO, et al. 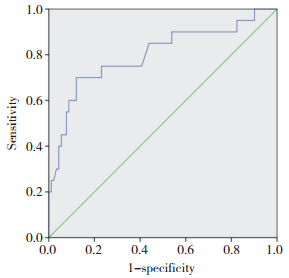 Neutrophil-lymphocyte ratio as a predictive factor for tumor staging in colorectal cancer[J]. Turk J Med Sci, 2014, 44(3): 365-368.